Diskit Monastery – the oldest and the largest Buddhist Monastery in all of Nubra Valley, stands tall at an altitude of 10,300 ft in the cold desert of Ladakh. It was founded by Changzem Tserab Zangpo, a disciple of Tsong Khapa, in the 14th century, and belongs to the Gelugpa (yellow hat) sect of Tibetan Buddhism. It is a sub-gompa of the Thiksey Monastery. Today I am going to share a detailed travel guide for visiting Diskit monastery in Nubra Valley, Ladakh. 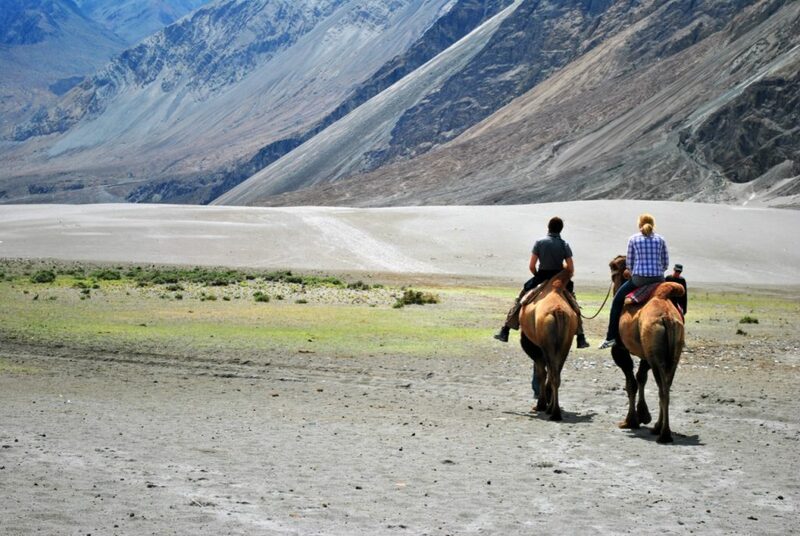 Tourists generally visit Nubra Valley as a two day trip from Leh and stay either in Diskit Village or Hunder Village. Where to stay in Diskit? 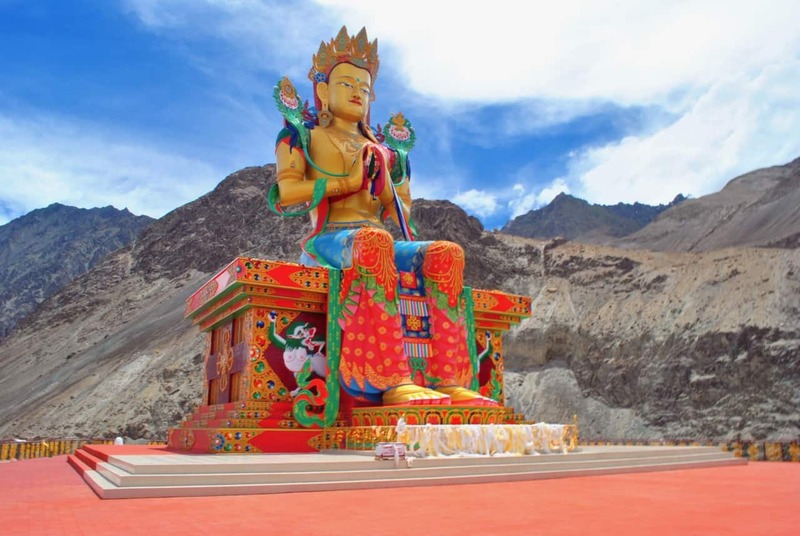 Diskit, mostly because of the 106 ft tall Maitreya Buddha statue, has become one of the most popular tourist attractions in Ladakh. This Buddha statue in gold and red faces the Shyok River towards Pakistan, right below the monastery on the top of a hill. Consecrated by the Dalai Lama in the year 2010, the statue is said to signify and promote three intrinsic ideas – protection of Diskit Village, prevention of further war with Pakistan, and promotion of world peace. The Diskit Gompa, milky white in color, is nestled on a high hill at the edge of a road that links with Parthapur and Those. You need to hike up to the monastery alongside the stunning white Chortens. Adorned with intricate frescoes and wall paintings, the Gompa is a delight to the eyes and the soul. Inside Dukhang, the prayer hall, there are huge drums and images of the Buddhist guardian deities. Diskit Monastery also has an elevated cupola (dome adorning a roof), with a wall fresco that depicts the Tashilhunpo Monastery of Tibet. There are numerous shrines, and Mongolian and Tibetan religious texts preserved in the storehouse of the monastery. Diskit Monastery has some Mongolian influence as well, which goes like this: there once lived a demon near the monastery who was an evil anti-Buddhist being, he was killed at the monastery, but is said to have been resurrected multiple times since his demise. Today, his wrinkled head and hand are said to be lying in one of the temples of the monastery. 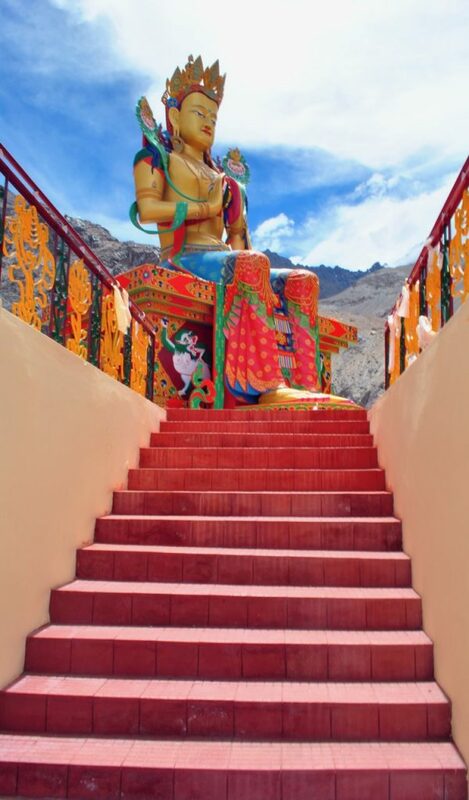 One of the oldest temples in the Nubra region is the Lachung Temple, which sits right above the monastery. Here, a large idol of Tsong Khapa, the founder of the Gelupa sect is deified. 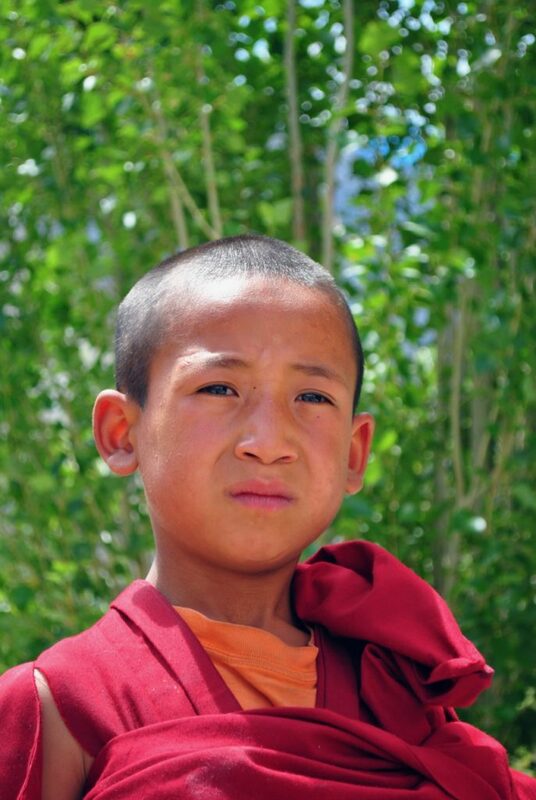 The monastery also runs a school in its premises, which teaches Tibetan children, with the help of an NGO called The Tibet Support Group. The most attractive part of visiting the Diskit Gompa is the spectacular panoramic view of Diskit Village and surrounding landscape that one gets from the top of the monastery. You just cannot miss it! 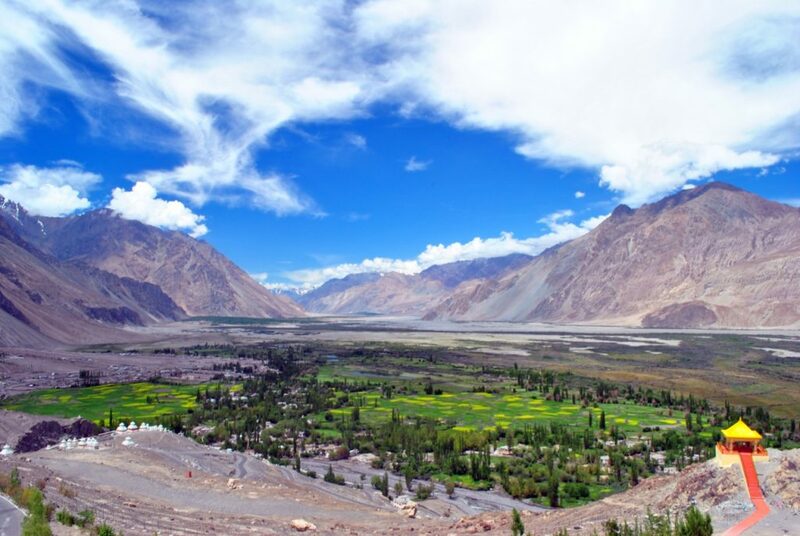 Diskit village is located in the Nubra Valley, which is best known for the double humped Bactrian camel, its night sky, the desert, and scenic landscapes. The Nubra River is a tributary of the Shyok River, which flows parallel to the Indus River on the northern side of the Ladakh Range. As the valley is at a lower altitude, it has a favorable climate for a lush green vegetation in the valley, thus rightly called the “Orchard of Ladakh”. While visiting Diskit, make sure you visit the river below for stunning sceneries. You should also visit the nearby Hunder village. The distance of Diskit to Hunder Village is just 8 km. Hunder is popular for its silver sand dunes, double-humped bacterian camel rides, beautiful settlements, and a clear night sky for star gazing. A visit to Nubra Valley including Diskit and Hunder as one of the top things to do in Ladakh in recent years. It can be easily covered on a two day trip from Leh after you have done your acclimatization. You can also board a local bus from Leh to Nubra and then hire a local taxi or bike to explore the local places. By road – The easiest way to reach Leh by road is hitting the Manali – Leh Highway via Manali or Srinagar Highway if you are traveling from Srinagar (J&K). It is imperative to know that state run buses and local taxis ply within the Ladakh region very well in the summer months. But roads can be closed during the winters due to heavy snow. 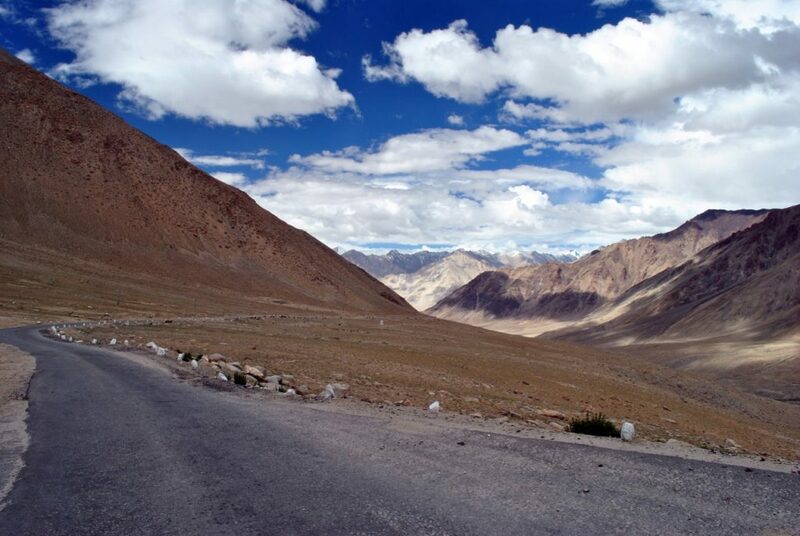 The road from Leh to Diskit in Nubra Valley passes through South Pullu (an army camp), then further to Khardung La, goes down to North Pullu, goes further down to the Khardong village, and down to the Khalsar village in the valley floor and then bifurcates into two. The left part from Khalsar village descends to the Diskit and Hunder villages, while the right branch road leads to Sumur and Panamik hamlets of Nubra Valley. By air – The nearest airport is Leh Airport, which is well connected with some major airports in India including New Delhi. From the airport, taxis can be hired to reach the hotel in Leh and then make a two day trip from Leh to Nubra Valley where you can cover Diskit Village and Hunder Village. By train – The nearest major railway station from Leh is Jammu Tawi, at a distance of 812 km from Leh. Taxis can be hired from the railway station to reach Leh over Srinagar Leh Highway in a 3-day journey with overnight halts at Srinagar and Kargil. After reaching Leh, you can travel to Diskit as mentioned in the article above. Joginder Nagar railway station is just 635 KM from Leh via Manali Leh Highway but is not a major one. The months of May to September is a very good time to visit Diskit Monastery, as the weather is most favorable for traveling. The weather is pleasant and roads to Ladakh are also open during that time. A popular festival called ‘Dosmoche’ or the festival of the scapegoat is celebrated here at Diskit with a lot of revelries usually in the month of January or February. So if you are willing to endure the harsh winter months and want to explore the white beauty of Ladakh, visiting Diskit during the Dosmoche festival would be a good time! The roads to reach Ladakh via Srinagar and Manali are closed from November to May, because of heavy snow. Therefore traveling via air is the only option to reach Leh, and further to Diskit monastery in Ladakh during winter time. 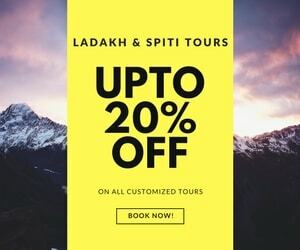 Hence, a good time to travel to Diskit monastery is same as the best time to visit Leh Ladakh.That is, from May to September / October when the roads to Leh Ladakh are open from Srinagar and Manali side. There are few guesthouses and homestays in Diskit village where you can stay overnight. You can also plan to stay at various homestays or guest houses in Hunder village, which is only about 8 km from Diskit. Hence, it does not really matter if you stay at Hunder or Diskit when traveling to Nubra Valley. There are some very decent hotels as well in Diskit providing the luxury and comfort for every budget. 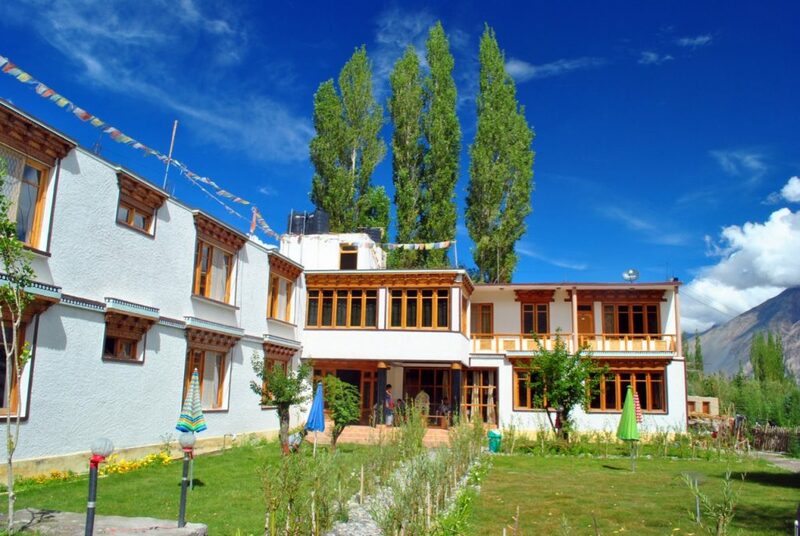 So, if you plan to book your stay on the spot in Leh, you will not go wrong with it. You can always refer some good hotels and guest houses in Nubra Valley. It is advised to have a meal as you leave from Leh, and stock some up as well. On the road, you can, of course, have a soup or supper at one of the world’s highest road cafe. After getting down from Khardung La, you can take a meal at dhabhas at either Khardung village or Khalsar village. You will get a decent number of food options once you reach Nubra and Diskit. Some does offer very nice and tasty local authentic Tibetan food and some will have noodles. It’s important to note that photography is not allowed inside the prayer hall and the museum at Diskit Monastery. Please follow the monastery rules and ask before taking a photograph of any monk. Do not step over the statue and respect the holy place. 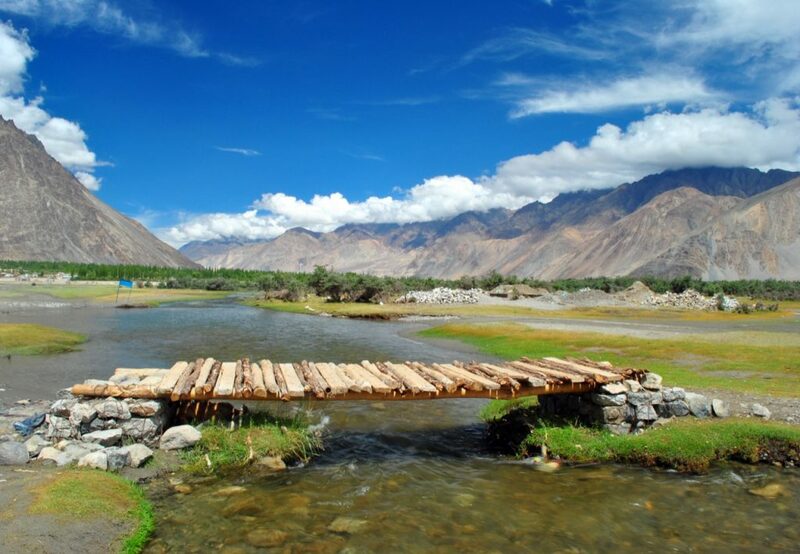 Travelers are advised to consult their doctors before commencing this journey to Nubra Valley and Ladakh because it can be tedious and demanding, and the climatic conditions can get extreme, especially in winters. Besides being unbearably cold in the winter season in Diskit, Nubra Valley, AMS (acute mountain sickness) may hit even the most experienced travelers, as the altitude is high and vertiginous. As of 2016, Diskit petrol pump remains fully functional even in the winter months in Nubra Valley. So, you can pretty much rely on it for fuel availability in case you are planning to cover Turtuk as well on your Nubra Valley road trip. BSNL and Airtel postpaid numbers work fine in Leh Ladakh, other networks do not get any reception. However, once you cross over the Khardung La pass and get into Nubra Valley, you should expect only BSNL postpaid connections to work. BSNL post-paid mobile connections also work in Diskit and Hunder villages in Nubra. BSNL has the widest coverage and Reliance Jio has also begun its operation starting 2018. You should check my tips on mobile connectivity in Leh Ladakh. Since the construction of the mighty Maitreya Buddha statue, Diskit monastery has seen a multifold increase in the footfall. Visit here for the night sky, awe-striking imagery of the landscapes, panoramic views of the cold desert, and most importantly for the inner peace that this ancient monastery imbibes. You can cover Diskit Monastery trip with other sightseeing places in Nubra Valley like Hunder, Sumur, Panamik, and Turtuk as a 2-3 days trip from Leh. I hope this travel guide for visiting Diskit monastery will help you plan a successful trip to this holy place in Leh Ladakh. If you know your friends or family are planning a trip to Nubra Valley and Diskit Village, do share this article with them to help them make a memorable Leh Ladakh trip. 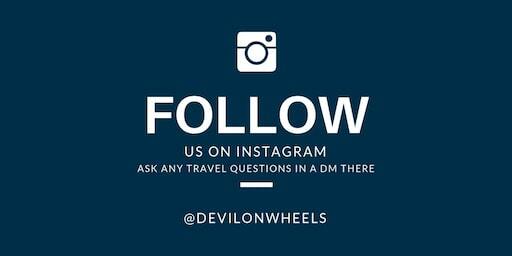 A Chartered Accountant by education, a traveler by passion. When not traveling, I am writing travel stories, cooking and watching movies, but mostly day dreaming about the mountains. Also a dog lover essentially. Impressive 106 feet long statue of the Jampa (Maitreya) Buddha facing the Shyok River on top of a hill below the monastery is a must visit. Hi sir, just wanted to ask something. I am solo traveler and wanted to go on a winter snowy trek or maybe a valley. Can you suggest few? Like someone told it’s not safe to do kedarkantha without a company right now. Where should i go to. I was very much willing to go to the jalori pass in tirthan valley. I read your guide as well. I want to ask is it safe going to the pass this week? Or the pass may ne closed altho jibhi will remain open but about the jalori pass?